I acknowledge the fact that broccoli is not the most exciting vegetable. I can see on my kids faces every time they find on they lunch plate. However, I think the nutritional value of broccoli makes it worth exploring all the possibilities of making it tasty. I am somewhat infatuated with veggie burgers these days. They offer endless variations when it comes to the vegetables that can be used, and the flavors being added. They make light and nutritious lunches or dinners. Leftovers are good to pack into lunch boxes the next day. When I saw a recipe for a broccoli burger, I was intrigued immediately. The original recipe called for broccoli and cashews. I remembered my broccoli pistachio soup whose combination of ingredients resulted in an amazing cheesy flavor, despite being vegan. Veggie burgers are pretty fragile creatures if you don't want to use a mountain of glutenous breadcrumbs in it. I tried to bind the burger mixture with oat and quinoa flakes. I admit, it's not quite the same as breadcrumbs, but it helps a lot. What I am saying is, don't give up when the the burgers don't hold together as much as meat burgers or veggie burgers with breadcrumbs. The flavors are amazing and are definitely worth a bit of experimenting. Good luck! Steam the broccoli florets for about 5 minutes or until tender. 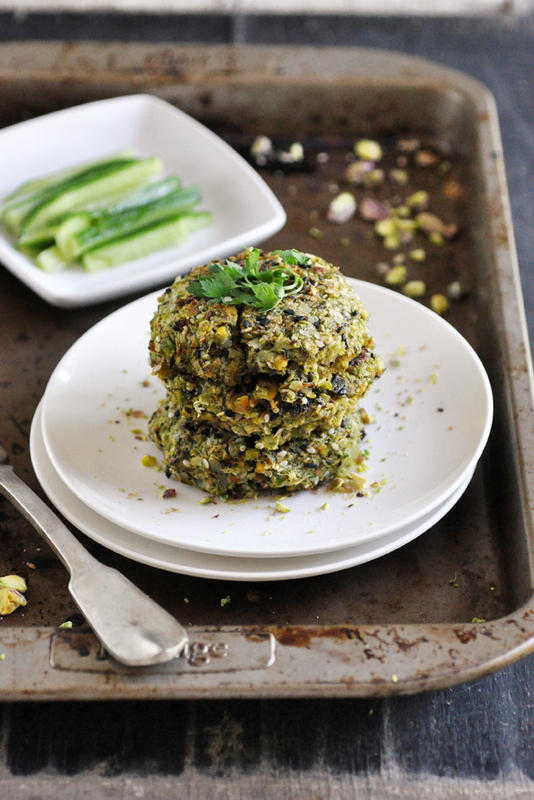 In a food processor blend cooked broccoli, pistachios, sea salt and chili flakes until mixture sticks together. Transfer mixture to a bowl and knead in quinoa or oat flakes and seeds. Let stand for about 10 minutes, so the flakes can absorb some moisture. Form patties of the size of the balm of your hand. Handle the patties with extra care, as they break quite easily. Shallow fry the patties in a little olive oil over medium heat, about 3-5 minutes on each side. Serve in burger bun or with your preferred burger sides.